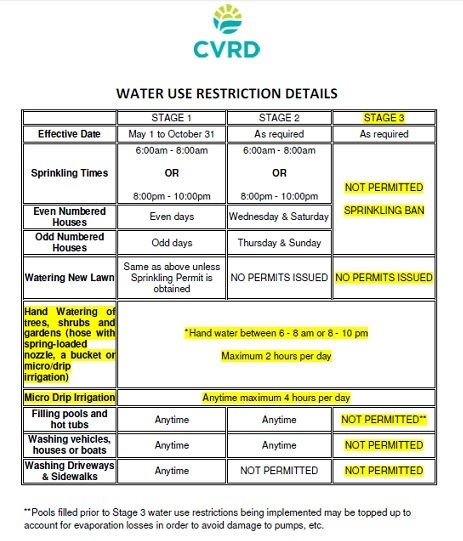 CVRD has put stage 3 watering restrictions in place for Burnam water system. Why are school and municipal playing fields exempt from the restrictions? These areas are often too large to be effectively irrigated within the allowed sprinkling times. Also, most playing fields are built on a sand base for better drainage. Turf grown on a sand base can die if not watered. Due to the high replacement costs of playing fields and large irrigated grass areas, the Cowichan Valley Regional District (CVRD) believes it is poor use of public money to let it die due to lack of watering. Irrigation to turf is shut down in community and regional parks during Stage 3 watering restrictions. In addition, the CVRD is reducing the amount of irrigation to sports fields with limited use; however, fields must be maintained at an acceptable level to avoid liability concerns. What about gardens, flower beds, and trees? Residents can use a bucket, spring-loaded spray nozzle or micro/drip irrigation to water trees, shrubs, flowers or vegetables on any day of the week during Stage 1, Stage 2 and Stage 3 water use restrictions. It is suggested that watering take place between 6-8 am and 8-10 pm (maximum 2 hours per day) in order to reduce evaporation and increase efficiency. What about my car or boat—can I wash them? Vehicles and boats can be washed at any time during Stage 1 and Stage 2 water use restrictions. To prevent the unnecessary wasting of water boats and cars must be washed with a hose equipped with a spring-loaded nozzle and a bucket filled with water. Washing is not permitted during Stage 3 restrictions. What about a newly sodded lawn? New lawns should be planted in the spring to avoid excessive use of artificial irrigation during the drier summer months when water is limited. New lawns require a Sprinkling Permit in order to exempt them from Stage 1 water use restrictions. Sprinkling Permits are issued at the discretion of the Manager, Water Management, Engineering Services, and can be obtained by contacting the Engineering Services Department by email at es@cvrd.bc.ca or by telephone at 1.800.665.3955. Sprinkling Permits may be issued for 21 days where new sod has been planted or where the lawn will be grown from seed. Sprinkling Permits will not be issued during Stage 2 and Stage 3 water use restrictions. Do these restrictions apply to soaker hoses or in-ground sprinkler systems? Yes. The restrictions apply to all sprinkling systems. Why 6 – 8 am and 8 – 10 pm? Watering during the morning and evening reduces the amount of evaporation that occurs from the lawns, sprinklers and soil. Can I hose down my house or other outdoor surface? Stage 1 and Stage 2 only allow outdoor surfaces including houses to be hosed down; Stage 3 does not allow for hosing down of outdoor surfaces. If I pay my taxes why can’t I water my lawn whenever I want? Water rates and fees vary in range per year per household, depending on where you live. Increased demands in water consumption result in increased costs for pumping and treating water and eventually result in the need for upgrading of infrastructure which could increase rates substantially. Additionally, our water sources are not infinite and using less water benefits other system users and the environment that these sources support. If I live in a strata, how do I determine my watering day? The watering day is dependent on the address of the strata and not the unit number. Can my kids still play in the sprinkler? Yes, during Stage 1 and Stage 2; please ensure the water is shut off when playtime is finished.These Stages allow recreational use of sprinkling systems. Stage 3 is a complete watering ban that includes recreational use. If there is a total sprinkling ban, will my lawn die? Your lawn will naturally go dormant and turn brown during a hot, dry spell. A good rainfall or cooler weather may help revive your lawn. Watering lawns sparingly or not at all during the summer months saves one household up to 17,000 litres. I can’t meet the alternate day and time restrictions. What should I do? The water use restrictions must be met; automated sprinkler systems that cannot be programmed to comply with the restrictions will have to be manually operated. My fertilizer-pesticide-herbicide application requires watering outside my designated watering time? It is expected that the watering restrictions will be followed. Lawn fertilization is most effective when applied in fall, early spring and late spring. Fertilizer is more likely to harm your lawn then help it during a period of drought. If you do plan to fertilize your lawn during the summer months it is best wait until the forecast predicts steady light rain. I am not connected to a CVRD water supply. I use a private well or water source for lawn watering. Do the water restrictions apply to me? Water restrictions do not apply to those homes on private wells or water sources. However property owners are encouraged to be good environmental stewards and follow the water use restrictions to conserve this vital resource. Aquifers are, for the most part, interconnected with river flows or neighbouring properties water resources, therefore, the more everyone can reduce their water usage the better. What is considered wasting water?  Washing of vehicles with a hose not equipped with spring-loaded nozzle or shut off valve at the discharge end of the hose. Why are there exemptions for commercial enterprises? Sprinkling regulations are meant to reduce water use in ways that do not cause serious economic hardship. Those users requiring water as part of a commercial operation are expected to conserve as much water as possible without resulting in a loss of business. My neighbour is not using water in accordance with the water use restrictions. How do I report this offense? Reports can be made to the CVRD via telephone, e-mail or in person to the Engineering Services Department. Please record the address and street that the violation has occurred at as well as the time and type of violation. How does the CVRD enforce the water use restrictions? Thanks to the folks at the Shawnigan Focus for the Canada Day write-up – it’s going to be a great day, and I look forward to seeing everyone there! If you’re in a Shawnigan state of mind, there’s lots to do on July 1 because the village will be rocking. The day begins with a pancake breakfast at the Malahat Legion hosted by the Legion and the Mill Bay Lions Club, supporting their community projects. 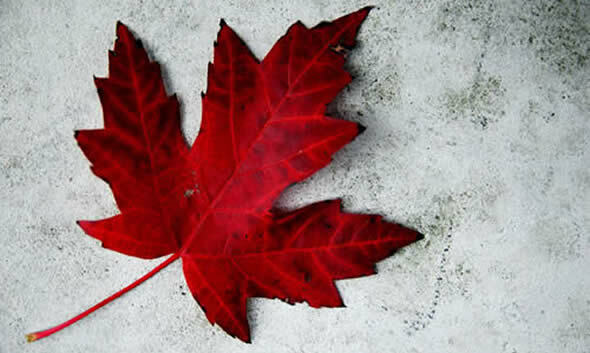 Breakfast will be served from 9 a.m. to 11 a.m.
After breakfast, the South End honours Canada’s history by raising the flag and singing O Canada at the flagpole at Cairn Park, across the road from the Legion hall. Assembly for the annual Canada Day parade will happen just before 11 a.m. in Cairn Park, then the parade will lead off at 11:30 a.m. down Shawnigan Mill Bay Road to the Elsie Miles school grounds. Find a good spot along the route to wave on local organizations, children on decorated bicycles, floats and more. A Family Fun Carnival on the Elsie Miles grounds will include stage entertainment by Pony Club, Country Trio and belly dancers. There are Kids Can Build projects made from wood, jousting and an inflatable obstacle course; a concession; games; fish pond; and Shawnigan Fire House. There will also be a giant birthday cake. The grounds will be open from noon to 3 p.m. so come and enjoy. A mini Canada Day Triathlon will offer a chance to get wet without going into the lake and a portable ball hockey game will also be set up for young hockey enthusiasts. The Shawnigan ‪Museum will open the museum so drop in for a walk down memory lane. This event is hosted by the Shawnigan Lake Community Association and supported by the Province of B.C. and the Government of Canada. It is shaping up to be an extremely hot and dry summer, and it is important that we all conserve water. 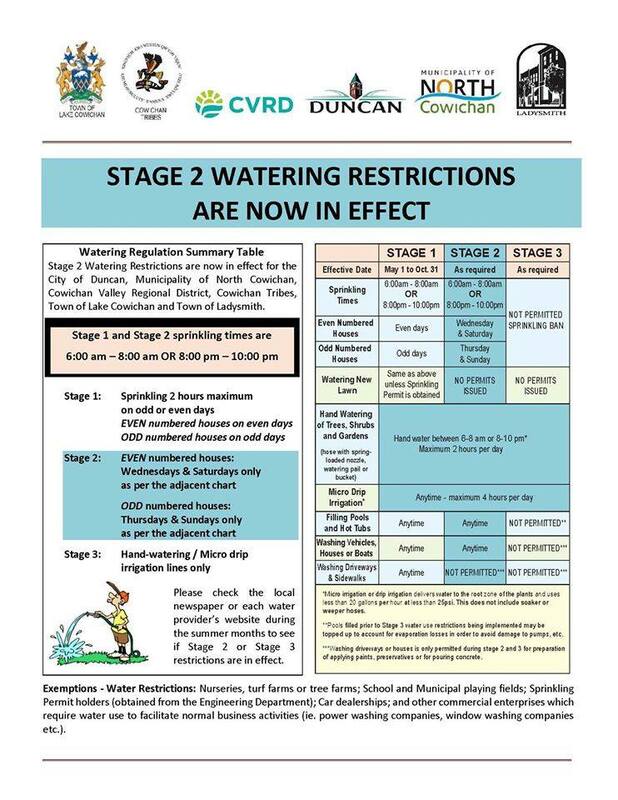 Please be aware of the guidelines around Stage Two Watering Restrictions, which now apply in the CVRD. We are in a serious drought in the Cowichan Valley. The CVRD has implemented stage 2 water restrictions, and open burning is banned. CLIMATE CHANGE – To understand more about how the climate is changing and what it means for our community come to a town hall meeting Monday, June 22 @ the HUB in Cowichan Station at 7 pm. Guest speaker is renowned climate scientist, Dr. Andrew Weaver and a panel of thoughtful community members will be on hand to help lead a brainstorming session. This motion will need to move forward to the CRD Board. It is not on this week’s CRD Board Agenda – I will post it here when it does come onto the agenda. There are two items on last week’s Regional Services Committee meeting that I would like to invite feedback from the community on. The first is a proposal for a Regional Arts and Culture Service Function. The second is the Report on Commissions. Please email me at sfurstenau@cvrd.bc.ca with your thoughts and input.